Lee DelleMonache, director of Neumann University’s Institute for Sport, Spirituality and Character Development. Lee DelleMonache has never been to Italy, but her first trip will surely be a memorable one. She is one of 100 people from around the world selected to participate in the international seminar “Coaches: Educating People” at the Vatican on May 14-15. DelleMonache, director of Neumann University’s Institute for Sport, Spirituality and Character Development, is eager to interact with attendees. “I want to be fully present for those two days and share our story in a way that could be inspirational to others and take in what everyone else is doing and come back inspired to enhance the work we do here at the institute,” she said. 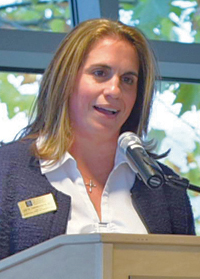 She was unaware of the seminar until Father Friedrich Bechina, undersecretary for the Pontifical Congregation for Catholic Education, came to Neumann University in February during a visit to the United States to see how Catholic colleges and universities advance and integrate their Catholic identity. Michael Galligan-Stierle, president of the Association of Catholic Colleges and Universities, accompanied Father Bechina on his tours of Catholic universities, including Neumann. “Michael brought him here to see how we advance our Catholic identity through athletics,” said DelleMonache, who took Father Bechina through the Mirenda Center and told him about the institute’s night of reflections for athletes, training and support of team chaplains, and leadership development for team captains. “You’re not coming to the seminar?” he asked. She informed the priest that she had not been invited. As a result of Father Bechina’s visit, DellaMonache received an invitation to participate in the seminar. The work of the institute at Neumann, she said, is to make coaches aware of the positive impact they can have on the formation of their athletes. Seminar presenters from the United States, Germany, Spain, Argentina, Australia, Philippines, Italy and Korea will focus on the pivotal role coaches play in the formation of their athletes. Attending the seminar will be athletes and coaches, university professors and instructors, missionaries in the world of sports, and experts in the field of sports and education. St. John Paul II instituted the Church and Sport initiative 10 years ago. Since then, the pontifical council has organized three international seminars: “The World of Sports Today: A Field of Christian Commitment” in 2005; “Sport: An Educational and Pastoral Challenge” in 2007; and “Sport, Education, Faith: Towards a New Season for Catholic Sports Associations” in 2009.